September 15 marks the beginning of the Hispanic Heritage Month in the United States; at the same time, Philadelphia celebrates the Welcoming Week, and countries like Salvador, Honduras, Costa Rica, Guatemala and Nicaragua remember their independence. 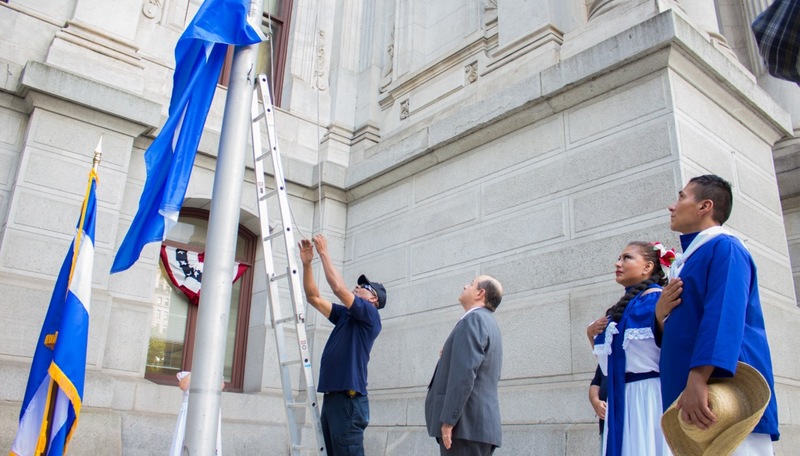 But this year, it was the first time that the Nicaraguan community in Philadelphia saw their flag raised in the City Hall. The ceremony, which began at 2:15 p.m., was preceded by Eli Gabay, the honorary consul of Nicaragua; Miriam Enríquez, Director of the Mayor's Office for Immigrant Affairs, Sheila Hess, the Office of the Representative of the Municipal Administration and members of the community. Eli Gabay, honorary consul of Nicaragua in Philadelphia; Julio Pahuil, member of the community; Sheila Hess, representative of the municipal administration; and Miriam Enriquez, director of the Philadelphia Office of Immigrant Affairs. One of them was Don Julio Pahuil, a Nicaraguan immigrant who arrived 40 years ago in the city and has since been a number one witness of the development of his community in Philadelphia. For Mr. Julio, the raising of the Nicaraguan flag is the tribute that his community deserves because, although they are apparently few, it implies recognition of their presence and their ability to work. Don Julio was not the only Nicaraguan who had to wait so many decades to see the national flag of his country waving in the north side of the mayor's office. Ernestina Lejarsa arrived when she was 7 years old; today she is in her forties, and although she grew far from her country, she keeps an accent as pure as the natural landscape of Nicaragua. Ernestina, who arrived at the ceremony wearing a typical costume of her country, didn’t hide her emotions. "Nicaragua is my homeland. My dad never allowed us to forget where we came from, our cultural roots have always remained alive in our house," she said when asked by this reporter how she felt about that date. Eli Gabay, an Israeli lawyer who acts as honorary consul of Nicaragua - and who has lent support to the community for years - said that this event is also the recognition of the importance of the cultural and economic ties that bond the city with the Latin American country. According to Gabay, these ties exceed 90 million dollars annually in trade. Eli Gabay, honorary consul of Nicaragua in Philadelphia. 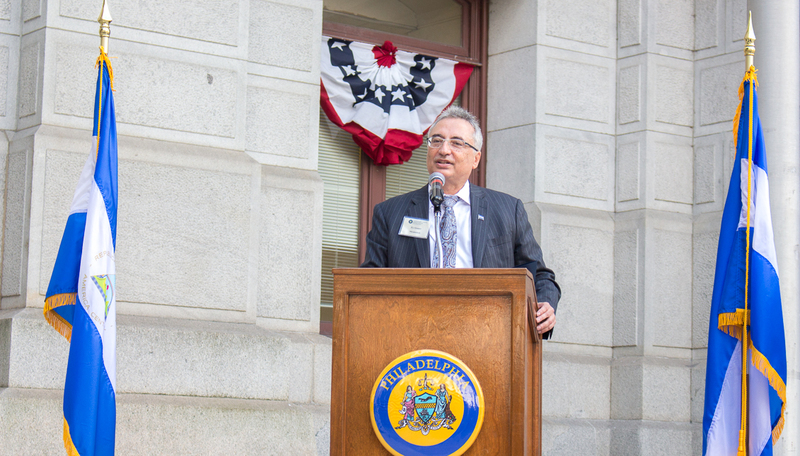 Asked about the importance of the Nicaraguan community in the city, the honorary consul didn’t hesitate to point out that, "although Nicaragua is a small country - and so it’s its community in Philadelphia – it represents a community that has produced leaders and representatives at the municipal level, and has contributed enormously to the city. " One of those great contributions is undoubtedly Miriam Enríquez, a proud descendant of a Nicaraguan family who immigrated in the 70's and who’s now director of the Office of Immigrant Affairs of the city, an entity that implements all the policies to host the thousands of people arriving annually to settle in the region. Miriam Enríquez, director of the Office of Immigrant Affairs of the City of Philadelphia. "When I started this work and learned about flag-raising ceremonies, one of my dreams was to have a ceremony for Nicaragua in our city. I cannot express the happiness and pride that I feel because that dream today is a reality. This ceremony is a great opportunity to show the city everything that the country and the Nicaraguan community have to offer." Visibly excited, Enríquez said that perhaps none of her relatives ever imagined seeing one of their own giving "the welcome speech to the ceremony of raising the flag of Nicaragua in the mayor's office." 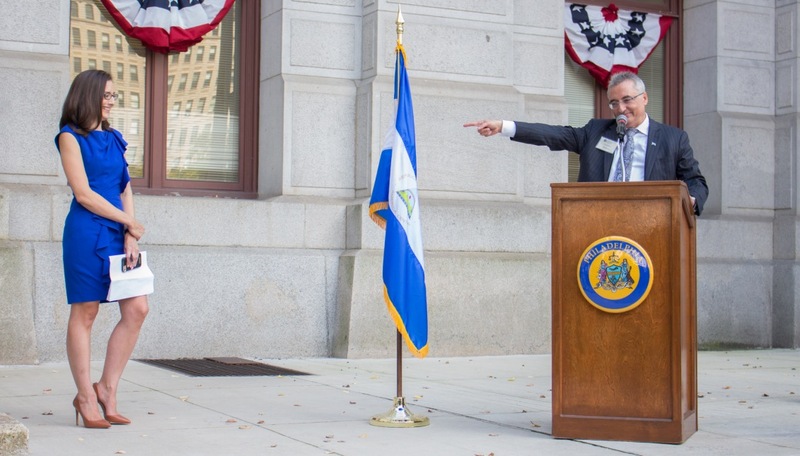 Ceremonial rising of the Nicaraguan flag in Philadelphia. Last Friday, Nicaragua celebrated the 195th anniversary of its Independence. The celebration in Philadelphia was attended by more than fifty people who, in addition to singing the notes of Salve a ti, Nicaragua (the national anthem of the Central American country), observed a couple of folkloric dances from the Pacific and Atlantic coasts of Nicaragua and a reception inside the mayor's office.